Jacob Levy Moreno was to become famous world-wide for the development of the science of sociometry, the technique of psychodrama, and his pioneering work in group psychotherapy. This book examines the story of Moreno’s early life in Europe, as well as his years in America. René Marineau draws on his own research in the archives of Vienna, on many personal interviews with people who knew Moreno, and on Moreno’s unpublished autobiography to give us a full portrait of this exceptionally gifted man who thought of himself as ‘a special case of God’. 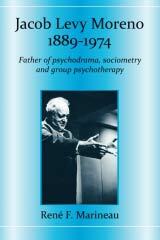 By revealing the history of Moreno’s early life and tracing the story of his early attempts to express powerful intuitions and beliefs, mystical in origin, through activity in literature, theatre, and medicine, the author sets the scene for a better understanding of Moreno’s total philosophy. Part One is a fascinating story in which we read of Moreno’s childhood games of playing God; his life as a student when he founded his first group – ‘The House of Encounter’; his part in the expressionist movement and intellectual circles in post-war Vienna; his first experiments with spontaneous and therapeutic theatre; and, not least, of the liberating influence of his meeting with his first ‘muse’, Marianne. Part two deals with the years in America, equally productive, when Moreno consolidated his theories, ran his own clinic and publishing house, and with the help of this second ‘muse’, Zerka, saw many of his bold and unorthodox concepts win acceptance and recognition. Moreno saw his contribution to the well-being of mankind as transcending his technical and theoretical innovations. Ultimately, he saw himself as a visionary and creator, offering human beings a new path to self-fulfillment. His story is of interest not only to psychiatrists, psychologists, and sociologists, but to anyone interested in understanding the process of genius in the making and the relationship between an individual’s personal journey and their legacy to the world. Students studying for certification as a CP or TEP will find this book’s advantages to their process.